The Thor Ratchet boot’s primary feature is evident in its name: the aluminum ratchet system. 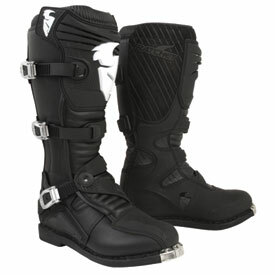 One of the major pain points with motocross boots (especially in this price range) is the buckles. Rather than try to completely reinvent a new closure system, Thor adapted one that was already utilized in other industries but hadn’t yet been introduced to the MX scene: ratchets. The ratchet system on the Thor Ratchet boot is simple. Every time you put it on, you get a custom fit that is secure and reliable. One of the best parts about it is that if you need to make minor adjustments while you’re out on a ride, it’s easy to do so. The boot uses three ratchets. The lower one uses an innovative Y-strap to help keep the boot secure. The boot also incorporates sleeves for the ratchet straps to ensure that the excess is kept tucked away and can’t catch onto anything while you’re riding. The Thor Ratchet is uses an off-road-style, stitched-on sole. The sole is hard, tough and includes an internal steel shank. A steel toe cap is in place. The toe box is covered with polyurethane, which wraps around the medial side of the boot. The heat shield is constructed with split-grain leather. The lateral side is constructed with synthetic leather; it holds up well for a long period of time and also provides great abrasion resistance. The interior is lined with bio-foam, enhancing comfort and providing support. It is protected from the elements by the gaiter on top. After the boot properly breaks in, it remains stiff enough to offer adequate protection while still providing comfort and flexibility. 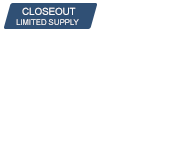 Ratchet closure buckle system delivers a secure, custom fit every time. Leather chassis construction gives excellent flex and feel. Welted rubber outsole includes steel shank insert for maximum support. Split-grain leather calf guard provides abrasion and heat resistance. Contoured shin plate and ankle plate offers impact and abrasion resistance. Bio-foam lined interior and insole provides superb comfort and cushioning. My second pair of these boots. Nice boots for the price. They are really worth the extra money over the really cheap boots. Boot fits great, nice and snug with lots of ankle support yet still comfortable. I feel very safe and protected with these. These boots are all I could ask for and more! Break in was a bit tough, missing gears, but finally they came around after filling them with water every day for a week and wearing them dry! Beware though, as others have reported, they run small in size. I wear a 9 and ordered at 10, perfect fit. Tight at the ankle pushing the foot through, but nice fit once there. The ratchets are a kick to work with. You can get the exact fit you want instantly with the amazing ratcheting keepers whether pants outside or inside or what ever. It is especially fun to demonstrate to others how cool the ratchets work, all are impressed.................as they should be! Great value for the investment. If they ever wear out, will come back for more. Thor makes cheap boots. The materials and workmanship is inferior. You get what you pay for. The soles on my boots lasted one day of riding. Very comfortable boot. Lasting very long through very rough conditions. Would recommend to anyone. These boots are great and have held up for 75+ hours of riding thus far! Highly Recommend! I bought these boots for my son for Christmas (it came early for him). He crashed pretty hard on about the third ride and tore the toe plate off one of the boots. He like them in general and I know they will last a long time, he is active duty USMC and only gets to ride once or twice a year. I used to own Thor boots and they were good for me. I've had these boots for a few months now, and I've have hit the desert, mountain single track, and the track with great results. They're holding up great, and I've kicked rocks, hit trees, and they have provided plenty of support. This is a great boot if you're on a budget. I tried on Comp 5's and man was I disappointed compared to the Ratchet. Good boot, and the buckle system is pretty nice. I am buying my second pair of these boots this spring, loved the fit and protection of the first pair and the ratchet buckels are great and do not get ripped apart or torn off like other boots Iâ? ?ve worn. boots run small had to order a size larger are very stiff but offer good protection. fairly comfy after break in but have only ridden in them maybe 15-20 hours and i dropped my bike once when i hit a patch of ice and the bottom ratchet ripped right through the leather. needless to say i cant find my receipt and thor wont do anything about it. moral of the story is spend more money on your boots and save your receipts. ordered next size up from shoe size (male) and they fit great. boots are a little warm but not bad. looks great and functions great. I have a lot of trouble with buckles coming loose with regular boots. The Thor ratchet boots never come loose. I also have narrow feet and this is the first pair of boots that actually fit. I highly recommend these boots. Great boots for a reasonable price!! I bought a pair of these white ones for myself, I usually wear about a size 7 in mens, but had to send them back for an 8. My husband loved the boots so much we ordered him a pair as well, we sized him up from a 9 to a 10. We have about 30 hours of trail riding on these boots, they've held up very well and are really comfortable. I know these are considered entry level boots, but I actually prefer this style boot compared to the more "advanced" boots. They are lighter, and I like harder sole compared to the molded rubber sole on the more expensive boots. The ratchet system is clever as well. Its more of a novelty feature, but I like it just the same. Boots fit just right. I am a 9.5-10 in shoes, and bought my Thor boots in size 10, fits perfect. The structure of this boot seems plenty stiff enough to offer good protection, but is flexible enough to make shifting and using the rear brake easy enough. If your looking for a quality light weight boot at a solid price, look no further than these Thor Ratchet boots. Overall a great boot but lower straps could be longer. After break in they are very comfortable. These boots are nice although I didn't realize how stiff they are. Still getting used to them while shifting( not a lot of ankle movement), maybe I still need to break them in. Worth the money. Uncomfortable at first, thought I needed a bigger size but after a few rides they broke in nice and fit great. Bought these as my first pair of riding boots, I have been riding my whole life and could never convince myself to spend the money on boots. These boots are very comfortable and durable, I spent 3 days of hard riding St Anthony sand dunes in Idaho and they were never uncomfortable one time, Def happy with these boots. LOVE my Thor boots. I am stuck on Thor products. Recomend them. This boot is great very durable, long lasting, and breaks in quickly. I would recommend this boot to anyone who wants a great looking durable boot. I like the Ratchet system but after only a couple rides i lost a strap and one buckle broke. They fit good and easy to get on and off but I would order a size larger than what you normally wear. Nice boot, but run a size small. I am very happy with these. They are VERY stiff at first but break in pretty quickly. I am impressed with how comfortable they were right out of the box. My 18 year old son rides 3-4 days a week and wore these boots about 2 weeks before the foot pegs on his Honda put a hole in the side of the boot while kickstarting his bike. Then after about one more week, one of the lower straps broke where it connects to the boot. My son really liked the feel of the boots and loved the ratchet buckles, but they don't seem to hold up very well to moderate motocross use. These boots are so easy to adjust that you would think more companies would use this system. As for safety, there's been a couple times where if i hadn't had these boots on I probably would of ripped my leg off. Next time I order boots i'll probably get the same pair.... I mean how can you beat the price. I like these boots, great price for the comfort and looks. But in less than a month of riding, the screws that hold the buckles are loose and I lost one of them on the trail somewhere. I'll be loctiting the rest of them in today! I'm waiting on my sz. 12 because the 11 I ordered were to small. My other Thor boots are 11 and put these with the Ratchet boot heel to heel there is an inch diff. So order 1 size bigger. Other then that, seems to be a good entry level boot for the $$$. I really don't know why other company's are not using the ratcheting straps on their boots. You can conform the boot to your foot perfectly every time. One problem I did encounter with this boot was sizing. They run at least one size to small. Other than that they are a well designed boot. So a couple things to be aware of. The toe box is really bulky. I can shift my CRF just fine but my toe no longer fits between the pegs and the shifter on my KLR. I have to shift with the back of my heel while I wait for an extended lever. The other thing is the boots are really stiff for the first 10 or so hours of riding. After that they break in and they aren't bad. Ratchet system is great, makes getting the perfect fit very simple. The buckles can be a little hard to release if they are packed with mud but otherwise great. Probably have about 50 hours of riding on them so far and they are holding up very well. No buyers remorse and I think you'd have a hard time finding a significantly better boot for the same money, but with that said I think I'll pony up for some Crossfires next time, purely for the hinged ankle. I have had my Ratchet boots for a few weeks now and I love them! I wear a size 11 in my fox shoes but I had to get a 12 and it fits and feels great. They are very comfy and waterproof too :) They provide excellent support and the buckles are sweet as well, they are aluminum. These boots are a little bit harder to get off because you have to push the release for 2 buckles at once but that is minor. I would highly recommend these! why are they so hot? Like 15 mins in the sun my feet are burning like I'm wearing winter boots, poor ventilation or what? BEST ANSWER: Cody, the fact they are black makes them a solar hot water heater! Ideas to consider: 1. paint them white, 2. fill them with water before putting them on, will help break them in as well, 3. try wearing socks that wick the moisture up and out of the boot. They are like wearing a plastic bag, not or any venting available.